Toronto’s Core Development Group is launching a new landmark community in the city’s east end. Located along Kingston Road, Birchcliff Urban Towns is nestled within an established neighbourhood adjacent to Toronto’s exclusive Fallingbrook community with the picturesque Scarborough Bluffs and Lake Ontario as its backdrop. 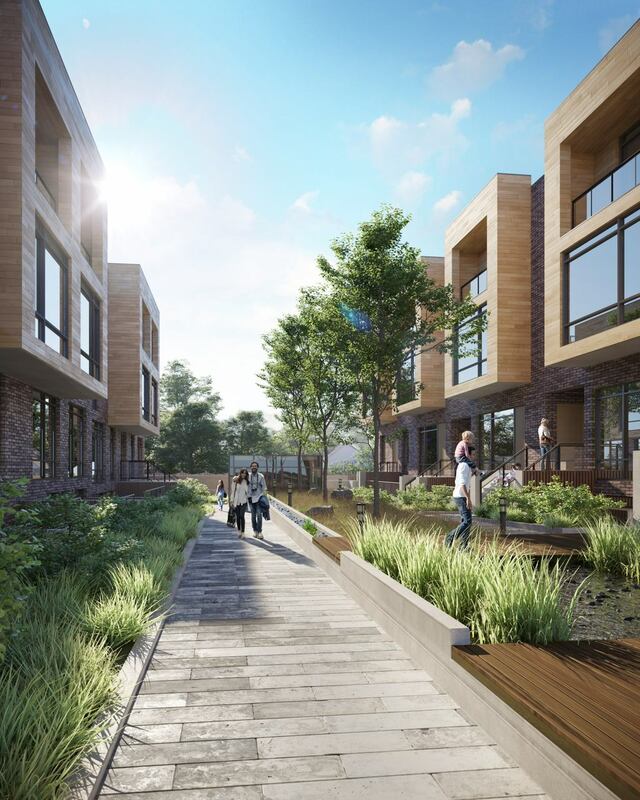 The development consists of a contemporary collection of 52 townhomes situated directly on the corner of Kingston Road and Birchcliff Avenue with available units fronting both streets. Designed by renowned architectural firm RAW Design, the exteriors boast a palette of clean lines and modern accents complemented by warm colours, large windows and elegant landscaping. Ample underground parking is available for residents to tuck their vehicles away from the streets as well as bike storage for those who ride on two wheels. Prices will begin in the mid $500,000s for a one-bedroom townhome, mid $600,000s for two bedrooms and from the mid $800,000s for three-bedroom two-storey units. Inside, the U31-designed suites are appointed with on-trend interior finishes and offer spacious, open concept layouts for easy living and entertaining. Standard features include nine foot ceilings, floor-to-ceiling windows and wide-plank laminate floors. The sleek and sophisticated kitchens come equipped with designer cabinetry and under cabinet lighting, quartz countertops and bevelled, high-gloss tile backsplashes. An energy efficient stainless steel appliance package with a refrigerator, range oven, dishwasher, microwave and hood fan is also included. Prospective homebuyers can choose an upper level Urban Town with a private rooftop deck complete with a barbecue area or a lower level suite with a secluded garden terrace. Each is designed to maximize both indoor and outdoor living and entertaining areas. Communal outdoor space will also be available for lounging, hanging out with friends or meeting new neighbours. The complex is arranged in a U-shape surrounding a central courtyard and outdoor amenity space that is private for residents. The landscaped green space at the heart of the development will feature lighted pathways, shade trees and a variety of beautiful plantlife and greenery. With seasonal farmers markets, recreational centres, boutique shops and restaurants. including local favourite Birchcliff Coffee Bar nearby, residents will be within proximity to a variety of amenities. The family-oriented area is also well served by both elementary and secondary schools and public transportation. Residents will enjoy living near the iconic shops and cafes of the Beaches just minutes away, as well as the Boardwalk parks that line the shore. Plus they’ll have convenient access to the extensive waterfront trails that wind their way from the Beaches to the breathtaking Scarborough Bluffs. To learn more about Birchcliff Urban Towns be sure to register online at birchcliff-towns.ca. For more information visit birchcliff-towns.ca or email info@coredevelopment.ca.